You probably have many questions about what to do after being involved and injured in an auto accident. If you have suffered car accident injuries, you might be concerned that while you’re recovering, you won’t be able to work and take care of the incoming medical bills. And you may be unsure about how to respond to requests for information from the insurance adjuster. Although you may not want to talk with an attorney about your accident right away, you do need to know about your rights and the steps to take after a crash. 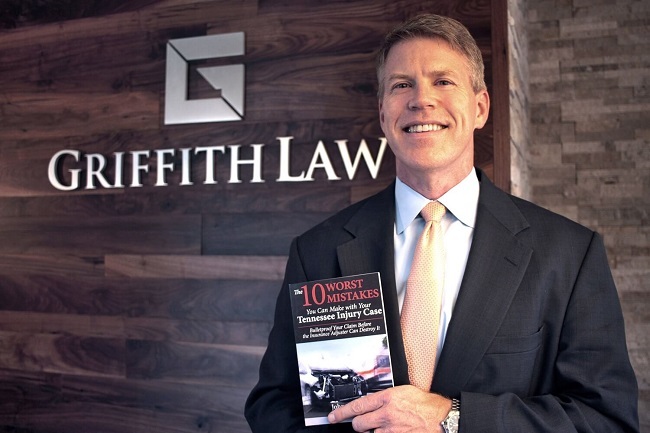 John Griffith provides you with this and other critical information for people with car wreck injuries in his free book. John’s background as an insurance adjuster before becoming an attorney has given him an inside view on how the insurance industry operates. His background handling more than three thousand car accident and personal injury claims makes him an expert in this area and is why you should read his book. After reading our Tennessee accident guide, you’ll be equipped with information and knowledge needed to help you deal with insurance adjusters. You will also be able to determine whether or not you need to hire an attorney or can handle your car wreck or personal injury case on your own. If you do want to hire a lawyer to represent you, our book provides information on how you can find the best attorney for your case. Get this free book to ensure the best outcome for your personal injury claim, and call us with any questions at (615) 807-7900.